Berkin is a high-population, pre-rich water world with a billion or more sophonts in population size. This world has a colony at Avis (world). Berkin is a water world, covered 98% in water, though approximately 15% of the world's oceans are locked in polar ice caps. This leaves some broad flood plains surrounding the tectonic mountain ranges that form the only dry land. The world has six small moons, each captured asteroids, two of which host part of the Imperial naval bases. These moons are large enough to affect tides on the water world below, and the combination produces a complex series of tidal effects. The system primary is a G2 V star with a close M3 degenerate dwarf star. Berkin is the site of an important Imperial naval base, the largest of the eight in the subsector. Berkin, as a member world of the Third Imperium, holds the estate of three members of the Imperial Nobility, who are charged with overseeing the world. 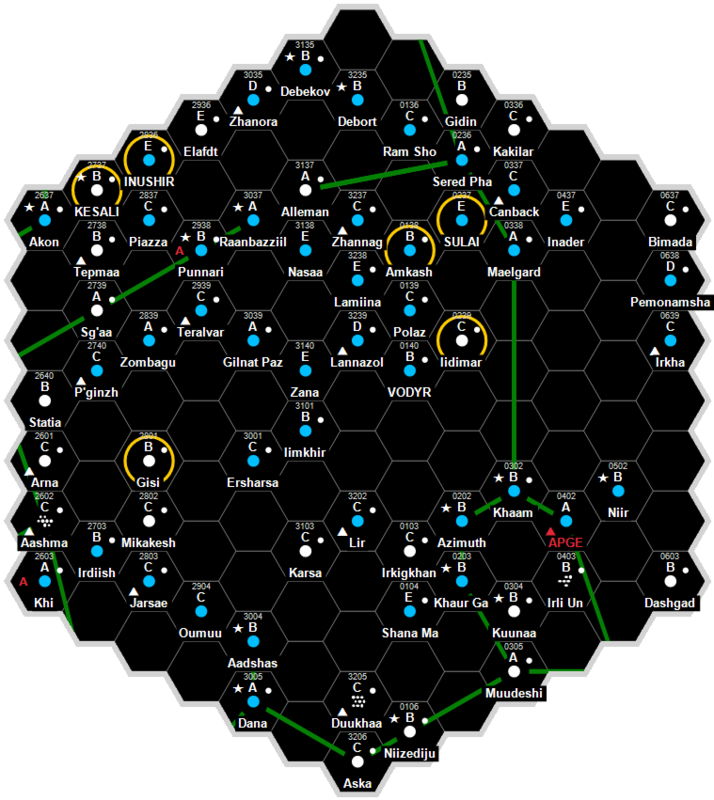 With Emperor Lucan reassigning the Old Expanses fleet to assault Dulinor, this left many of the worlds in the Old Expanses sector under-protected. In this power vacuum, the Solomani fleets invaded. Berkin was one of the many world to resist this invasion. With the resources of a high population planet and the Naval reserves, Belkin held off the Solomani advances for several years. Finally, in 1127 the frustrated Solomani resorted to Black War bombing raids of Belkin. Planetary bombardment not only destroyed the Naval base, it also hit many of the world's major cities. More dramatic in the long run were the secondary effects caused by raising tremendous quantities of dust and ash into the air. A mini-greenhouse effect caused the polar ice caps to melt, flooding the tidal plains where most of the planetary population lived and grew it's food. With the onset of the Virus, the last of the technology crashed, the flooding, famine, and disease caused a dramatic population decline. The water level rose an average of 20 meters, enough to flood all the major cities and the starport. The flooding wasn't high enough to completely cover all the buildings, which still house a nomadic population. The remaining population lives on the remaining islands. Most of the islands are surrounded by a system of dikes, which in some areas are being used to gradually reclaim land from the sea. The world is divided into thirteen separate political entities, with an average sustainable tech level of 5. There are a few pre-collapse grav vehicles, but most vehicles are wheeled. There is widespread use of submarines for military and salvage work, some of them very large. This page was last modified on 2 June 2017, at 21:33.